"The father, the son and the holy game." 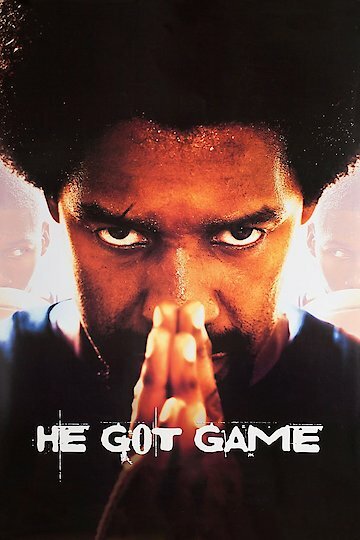 He Got Game is a dramatic film that stars Denzel Washington. Denzel plays Jake Shuttlesworth, who has served a long time in prison for the murder of his wife. Jake killed his wife during an argument when he shoved her to the ground. It was an accident, but Jake must still serve jail time. Jake’s son Jesus is an amazing basketball player. He is considered to be one of the best high school basketball players in the country. Every college in the country is pursuing Jesus in the hopes that he plays for them when he graduates high school. It turns out that the governor of the state is one of the many people who want Jesus to play for his college. He decides to grant Jake a week-long release from prison so that Jake could help persuade Jesus to sign with the governor’s school. If Jesus signs with the governor’s school, then Jake’s prison sentence will be shortened considerably. Jake begins to work on his son, all the while being following by probation officers to ensure that he does not make a run for it. Jake does have time for a lit bit of fun while on his temporary vacation from jail. He has a quick fling with a prostitute. Jesus, meanwhile, has a very complicated relationship with his father. He is obviously extremely angry with him for the circumstances surrounding his mother’s death. Jesus has been left to fend for himself for many years and has basically raised his younger sister as well. Jesus also has a complicated relationship with his girlfriend, and the young couple are basically up and down with each other. Jake and Jesus have a lot to work on in their relationship, and the primary focus of the film is the challenges that exist in any father-son relationship. Over time, Jesus learns to forgive his father and the two gradually become close. He Got Game is currently available to watch and stream, download, buy on demand at Amazon Prime, Hulu, Vudu, Google Play, iTunes, YouTube VOD online.